For many golfers, buying a new pair of golf shoes means looking for another pair of FootJoys. The brand name is almost synonymous with golf shoes at this point, and most golfers have owned at least a pair or two over the years. FootJoy offers a product line that ranges from affordable to luxury, and everything in between. Before you buy your next pair of golf shoes, you should at least try on the latest FootJoy models to see if you find something that fits just right. 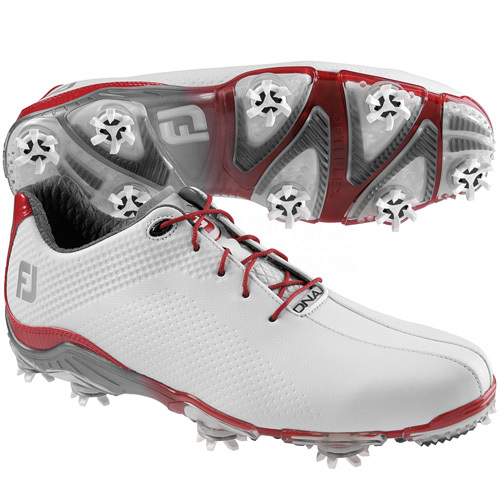 One of the exciting new models that FootJoy has to offer is the D.N.A. line. These shoes are lighter than the rest of the FJ line, weighing just 14.8 ounces. That lightweight design makes these shoes comfortable to walk in all day long. If you are a golfer who loves to stroll the fairways rather than ride in a cart, you should take a closer look at the new D.N.A. shoe. All golfers are familiar with the feeling of overheated feet after a long day playing under warm skies. Even if the weather is completely dry, you can end up with soggy socks simply from perspiration that has accumulated throughout the round. With that problem in mind, the MicroVent technology used on the D.N.A. shoes is designed to help your feet breathe during the day and limit the heat that builds up inside your shoes. Also, the shoe features a shaped tongue which enables an easy of movement for your feet so you can make the swings you want without your shoes getting in the way. Some high-end golf shoes can feel bulky or heavy when walking around the course. That is not the case with the D.N.A. from FootJoy. Instead, everything about this shoe feels like it was designed to be minimal and sleek. The cleats are low to the ground, and the whole profile of the shoe feels clean and understated. This makes for a shoe that is both great to wear, and great to look at. If you are a golfer who takes your appearance seriously on the course, you will be pleased with the way these shoes look with the rest of your wardrobe. There is a reason that FootJoy has carved out such an impressive profile within the golf shoe market – because they make quality products that work for a wide variety of players. The new D.N.A models are the latest in that tradition, and you would be wise to try some on for yourself at your local golf store.